Who's Up for Paul McCartney's Meat Free Mondays? I&apos;m racking my brain in search of a Beatles song that prophesizes or hints at Paul McCartney&apos;s future conversion to vegetarianism. Savoy Truffle? No. Strawberry Fields Forever? Hmm, not really about strawberries, is it? Maybe Piggies, from the enigmatic White Album, secretly conveys that eating meat is a barbarous practice akin to cannibalism, as the piggies themselves are gluttons for bacon. I might be clutching at straws here, but it&apos;s all in an effort to announce that Sir Paul McCartney is the new face of the Meat Free Mondays (MFM) movement, which on Monday, June 15th, launched an ambitious campaign with the goal of, you guessed it, making Mondays meat free. The central purpose of the MFM campaign is for participants to go one day per week without eating meat (including fish) in order to slow the onset of global climate change by reducing the amount of CO2 generated through industrial meat production. Alleviating global hunger and improving domestic animal welfare are also at the heart of this campaign, as both are detrimentally impacted by the voracious appetite of the western world. It&apos;s a simple concept - grain that could otherwise be sent to the third world is instead being gobbled up by our cows, pigs, and chickens. Decreased demand for meat would result in decreased livestock and poultry populations, and, consequently, the availability of more grain supplies for human consumption. Factory farms, notorious for the deplorable conditions in which they keep animals, would become less congested as a result of decreased demand, allowing penned animals a better quality of life simply through the provision of more space. Maintaining one&apos;s health is also a focal point of the campaign. Myriad studies have linked diets rich in meat and dairy to ailments such as heart disease and obesity, and even certain types of cancers. By reducing our intake of meats, we lessen our chances of developing any of these devastating illnesses. These are all compelling reasons to observe a meat free day every week. But how can we convince our carnivorous friends and family members to make such a commitment, which might seem impossible or at the very least undesirable upon first hearing? Maybe a history lesson will do the trick. Going meat free one day per week is not a novel concept. In fact, as a nationwide initiative, it&apos;s one whose origins extend back to World War I. Meatless Mondays and Wheatless Wednesdayswere part of a national campaign run by the U.S. Food Administration that encouraged Americans to voluntarily reduce their consumption of meat (cattle, hog, and sheep), wheat, sugar, and fat, in an effort to feed Allied Europe and the American soldiers fighting there. Central to the success of the campaign was the education of American housewives in the art of food substitution without compromising taste or nutritional benefits. Cheese acted as a substitute for meat, honey and syrups substituted sugar, and cornmeal, oats, barley, and rye replaced wheat. Federal and state level home economists, predominantly women, bolstered the campaign through the creation of innovative recipes and educational programs that saw even school aged children versed in the importance of food substitution, food preservation, and the folly of food waste. Some of the more interesting and easy to prepare recipes from this era are cottage cheese sausages, war cakes, and potato balls. Spurred on by the campaign slogan "Food Will Win the War" the campaign brought about a 15% reduction in domestic food consumption without rationing, and saw 18,500,000 tons of food sent to Europe between 1918 and 1919. What the success of Meatless Mondays and Wheatless Wednesdays proved was that the simple act of abstaining from meat and wheat one day per week made a huge difference to the outcome of the war. Who&apos;s to say that by doing the same now, we won&apos;t make a similar difference in the fight against climate change, world hunger, the demand for animal rights, and the health of our nation? Ninety years ago, Americans were willing to voluntarily alter their lifestyles if it meant contributing to the greater good. Is it possible that we&apos;re capable of the same level of personal sacrifice in this day and age? The MFM campaign is off and running. So, let&apos;s get on board and Help! each other out by making the world a better, healthier place to live. 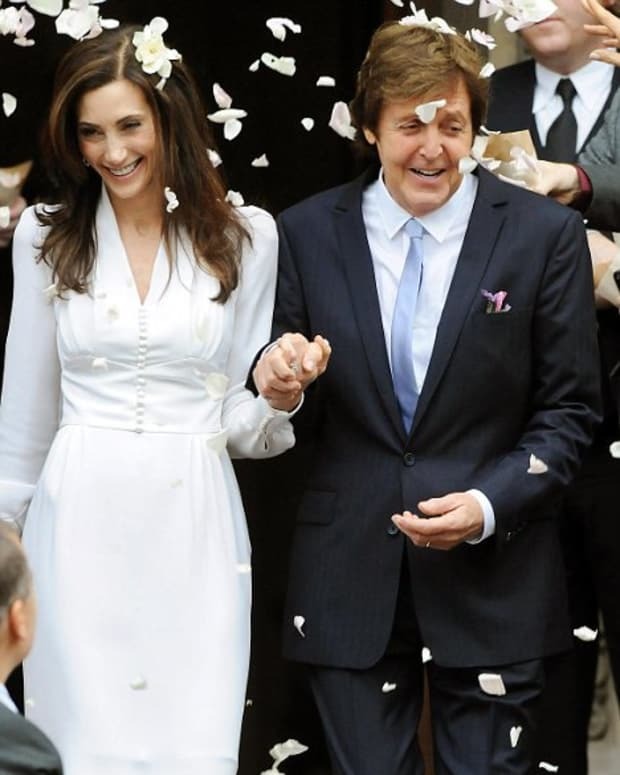 Paul McCartney Says Being a Vegetarian is "Easy"
Julian Lennon Snubbed by Paul McCartney?